A farm and a bog in a close suburb to Boston! We’ve combined two highlights of autumn running in one. Great Brook Farm State Park, only 25 miles from Boston, features 1,000 acres and 20 miles of wonderful trails — through meadows, woods, farmland, and bogs. There’s also the famous Kimball Farm ice cream stand for a post-run treat. 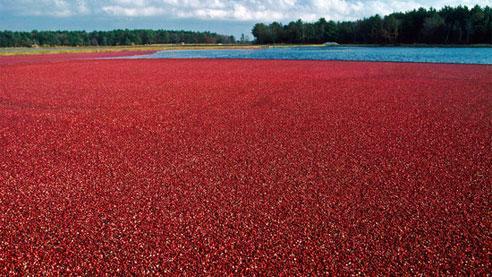 About 1.5 miles away is the Carlisle Cranberry Bog, at about 500 acres, some of which are in working production for cranberries. There are several trails around the bog and the woods, the highlight of which is the main trail over the dike, which affords fantastic views of the cranberries at harvest and surrounding trees at their peak, generally mid-to-late October. Enjoy a DIY run around the bog, or use our 5.2 mile out and back route from Great Brook Farm to the Bog, and around the main trail. The connection uses Curve St., which is a fairly quiet country road with nice views. Caution: No Sidewalk, run opposite traffic.